Canon officially announced three new portable zoom 4K UHD broadcast lenses: the CJ24ex7.5B, CJ18ex7.6B and CJ14ex4.3B. These new additions are compatible with 4K UHD broadcast cameras that have 2/3-inch sensors. MELVILLE, N.Y., April 2, 2018 – Canon U.S.A. Inc., a leader in digital imaging solutions, today announced the launch of three new portable zoom 4K UHD broadcast lenses1: the CJ24ex7.5B, CJ18ex7.6B and CJ14ex4.3B. These new additions are compatible with 4K UHD broadcast cameras that have 2/3-inch sensors. Flanking the existing UHDxs series of 4K portable broadcast lenses that deliver excellent optical performance, these three lenses usher in the newly launched UHDgc series that will broaden 4K UHD shooting options. These new lenses provide 4K UHD imaging quality at a price point that is more accessible to the majority of the broadcast market. Additionally, the new lenses provide impressive UHD optical performance while maintaining a compact and lightweight design to meet a wide range of needs for video productions that include documentaries, sports, events and news coverage. 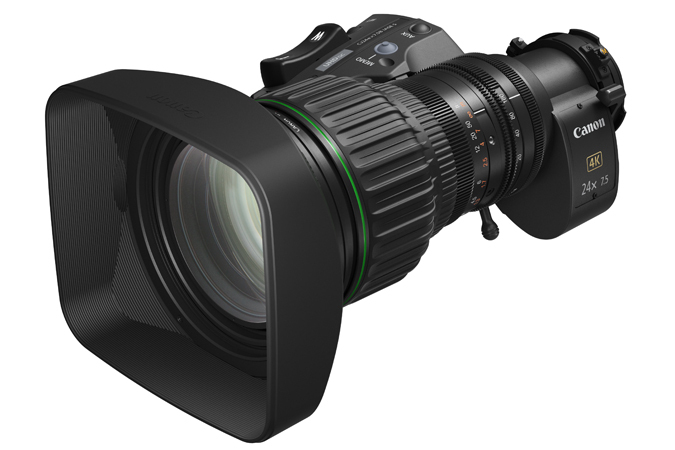 The CJ24ex7.5B, CJ18ex7.6B and CJ14ex4.3B utilize Canon’s proprietary optical design technology featuring materials such as fluorite and Ultra-low Dispersion (UD) glass to achieve high 4K UHD performance across the entire zoom range. In addition, the lenses support the wide color gamut approved by the ITU-R BT.2020 UHD broadcasting standard2. These features are essential to HDR imaging. The lens ergonomics and digital servo operational controls are similar to previously announced Canon portable zoom lenses, providing users with maximum mobility in a variety of shooting situations. The Canon CJ24ex7.5B and CJ14ex4.3B 4K Portable Zoom Lenses are scheduled to be available in summer 2018, while the CJ18ex7.6B lens is scheduled to be available in fall 2018*. In addition, the lenses are being shown publicly for the first time at the Canon booth (C4325) at the NAB Show 2018 in Las Vegas from April 9-12. For more information please visit, usa.canon.com/provideo.